Boasting a combined 120W LED output, the 3 x 40W RGBW LEDs coupled with a zoom feature and a continuous front-lens rotation offers mobile DJs and entertainers a unique moving head that creates superb mid-air effects. The 4 push button OLED menu allows for easy access to the functions including DMX, auto, sound active and master/slave modes. Loaded with advanced internal programming including a 180 degree forward facing show which further enhances the sound active and auto modes delivering stunning light shows. 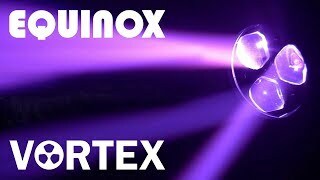 Considering purchasing the Equinox Vortex? Have questions? Ask people who've recently bought one. Do you own the Equinox Vortex? Why not write a review based on your experience with it. Excellent help with the DJ Kit team and they are very knolegable when it comes to light fixtures like these. Despatched the same day after purchasing a pair. I've never seen a light quite like this. I have have them on my equinox booth shelf either side and have them on the forward facing show mode and boy I'll tell you they punch out some mega bright beams. Using 2 they lit up a huge hall and they look fab with no smoke or incredible with smoke! Looking into using them with a DMX controller and getting another 2. Love em!! Good and bright. Performed well as a straight zoom with plenty of range. Even field with imperceptible colour shading. Quite nice white. Thatâ€™s before you start spinning lenses! as a effect I cannot fault this unit, lightweight, easily controlled and looks good with or without smoke. So why only 4*? The unit itself I would happily give 5* unfortunately like so many equinox products the DMX protocols in the manual are way off. spent 20 minutes building a freestyler fixture file and then spent another 1 hour with the unit plugged in adjusting all of the settings to get it to work properly. the inbuilt programmes are good. Using DMX will expose the full potential of this product. I ordered a pair of these with a bag and dmx cable. These are brilliant lights and highly recommended. In a small room you may want to setup on a dmx controller as they are very bright. On master/ slave there is a program that is forward facing. You will not be disappointed with these if you buy them. 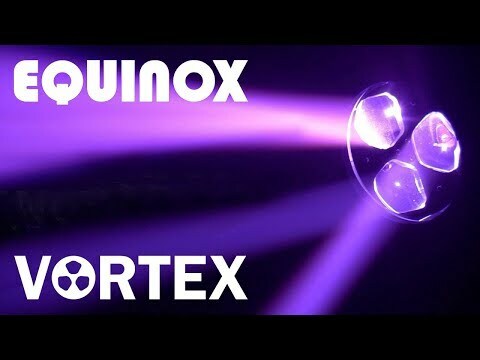 Seen a video for Equinox Vortex online or have you own video? Check out Equinox Vortex on DJkit.com!